NJNA 2012 | NJNA is Blogging! After much deliberation, the choice was narrowed to two. I got both, but will do the one pictured here for my first grandchild. Both selections are by Strictly Christmas, which paints all their stockings the same size, so as not to have jealousy among siblings, which was the case with my two girls. I’ll bring my purchases to the January meeting. I can’t wait to get started. 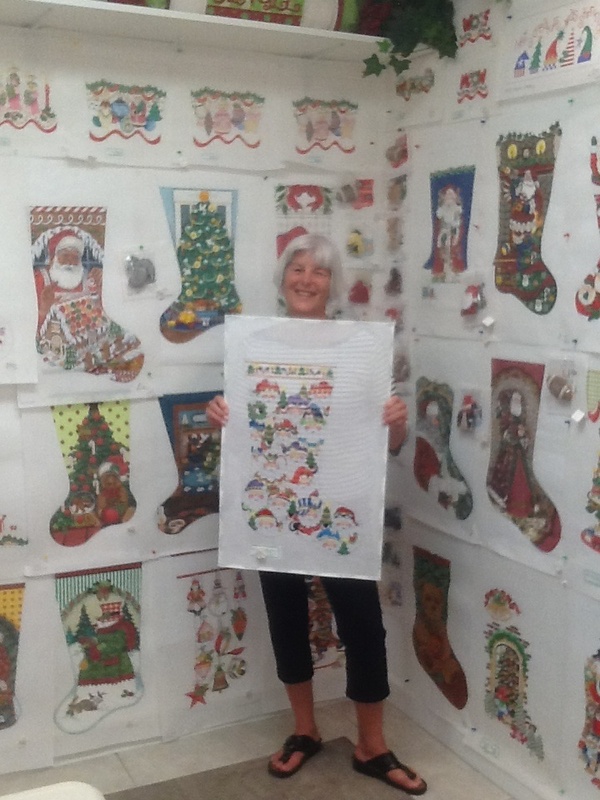 My daughter Margaret and I went to Needlepoint in Paradise to find a stocking for my first grandchild expected to arrive in late May. I wanted Margaret to pick out a stocking she would like for her child. My mother needle pointed stockings for all four of her grandchildren, and I wanted to carry on the tradition. As we walked in, Margaret exclaimed “oh Mom, this is the jam for you!” That means my paradise in her generation. I’ll try to attach a picture of the corner of the store with the stockings. Heidi’s Progress in Nov. – Dec. Since I am unable to attending the meeting on Wednesday, I wanted to share with you what I have done. 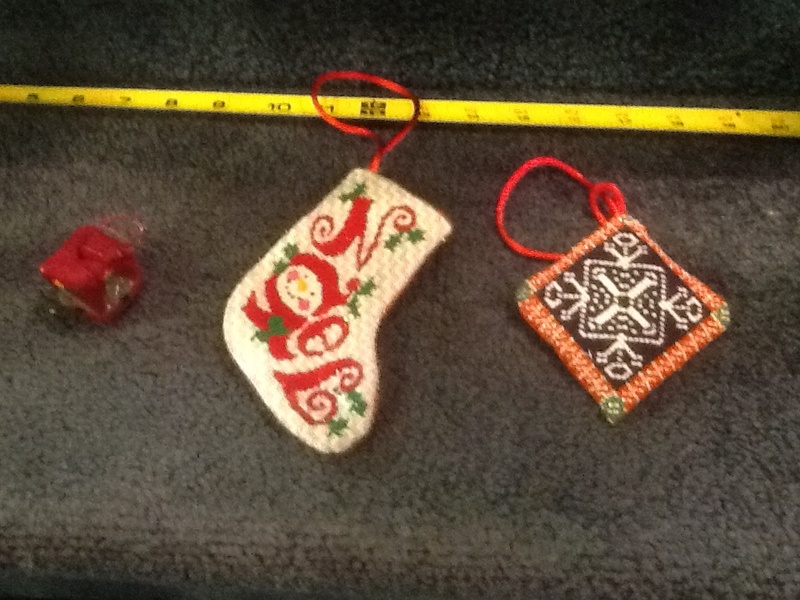 Pictured below are the three Christmas items I have stitched and finished. The red and black ornament to the right, which I got at a previous NJNA Dec. gift exchange, is a gift for Pam this Christmas. The stocking in the middle I purchased at a trunk show at Mrs. Stitches., and started down in Florida in Oct. Bill and I are going to be grandparents for the first time in May. I will hang this little stocking with our others next week to recognize the the coming baby. The little red square ornament is a gift for my coming grandchild. I intend to gift an ornament each year. While my daughter is with me in Florida, we are going to this fabulous needlepoint store, Needlepoint in Paradise, in Naples, which I discovered in Oct. I will have her pick out the Christmas stocking that she would like me to stitch for her child. I’ll have a deadline of a year to get it finished. May you all have a joyful Christmas and a wonderful new year. When Sue C and I visited Gladstone Country House last year, we decided that this outing needed to be a December tradition. 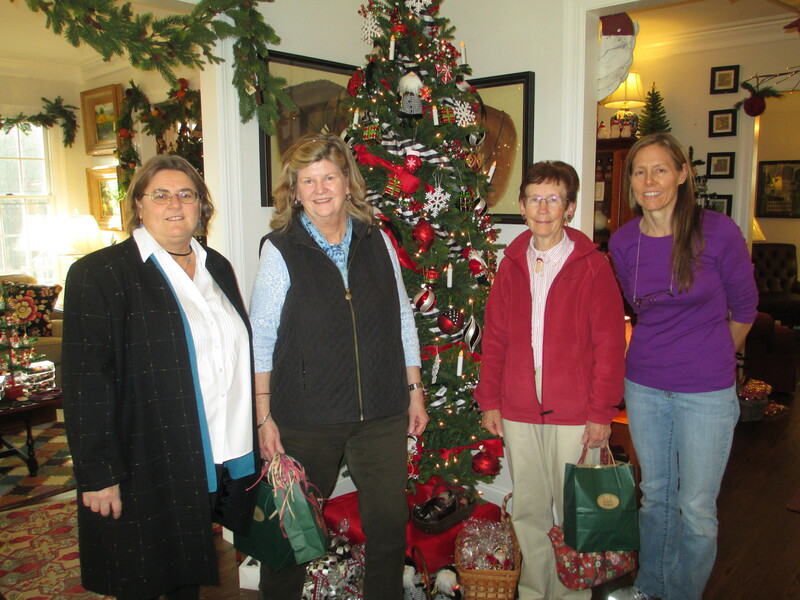 So today, Sue R joined us for our second annual Holiday visit to Ellen T’s store in Gladstone, New Jersey. And what a wonderful day it was! After we made our purchases — complete with gift wrap when needed — we tooled on down the road to Cafe Azzurro for lunch in Peapack, New Jersey. A yummy time was had by all! We’re already anticipating our “third annual” visit next year! PS — Ellen has an awesome tradition of providing a complimentary Christmas ornament with your purchase! About two weeks ago, I got an e-mail from Sue C inviting me for an impromptu stitch-in at her house. It seems that two of her stitching friends were bunking in with her because they didn’t have power restored after hurricane Sandy. 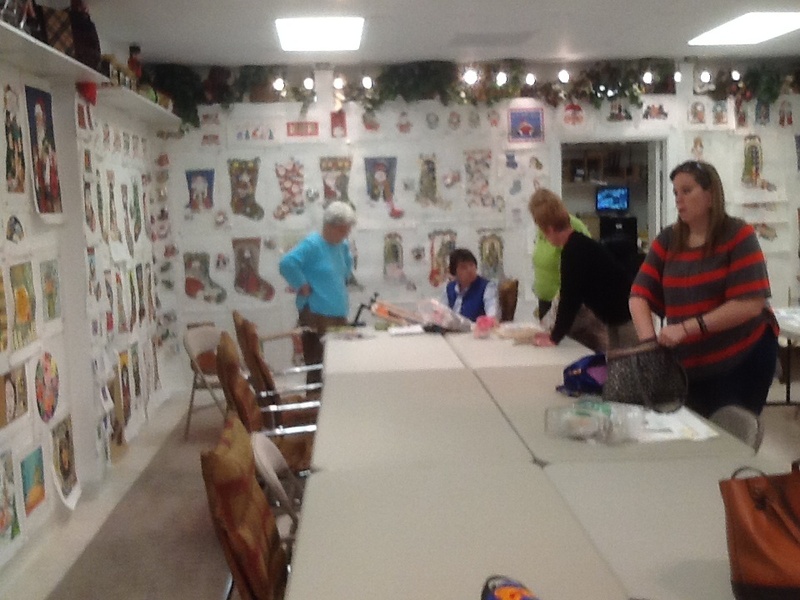 So — we spent a fine Thursday afternoon stitching and making new friends. A great time was had by all! 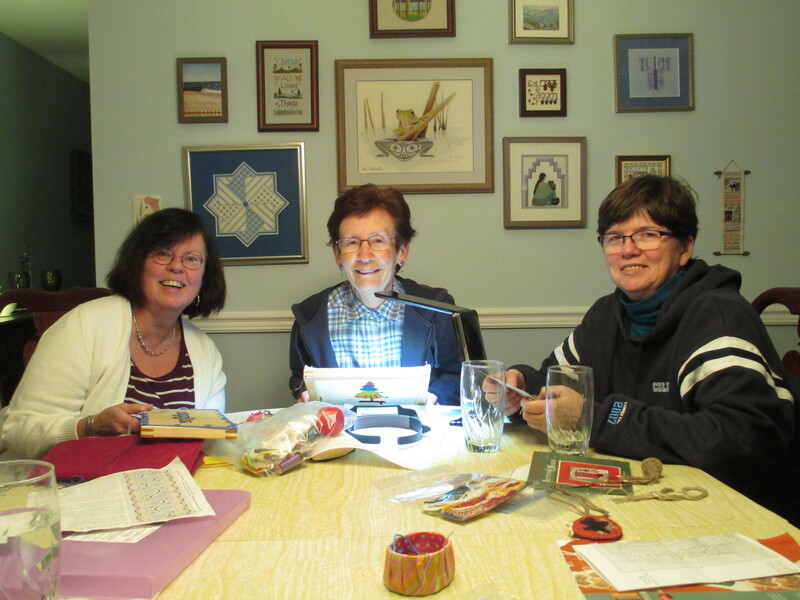 Carol, Sue, and Jill stitching in the aftermath of hurricane Sandy! 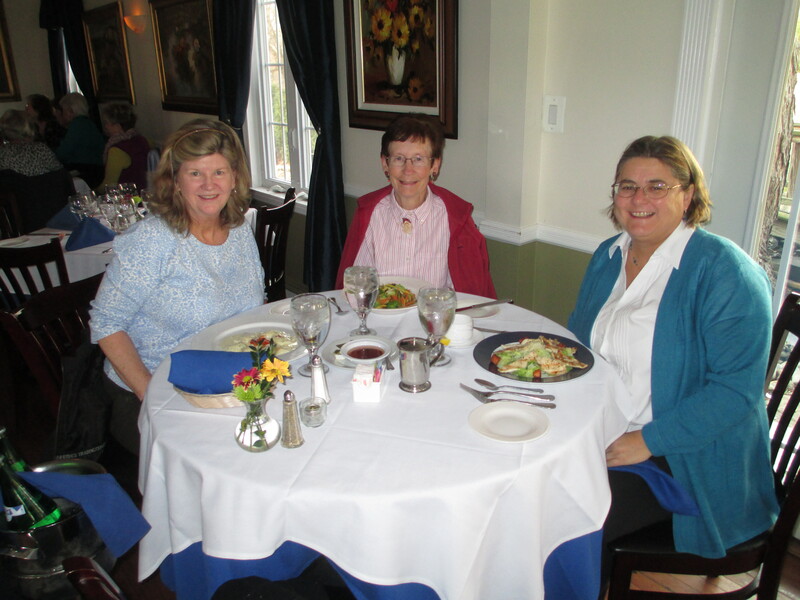 NJNA members will recognize Carol and Sue, but did you know that they are both members of EGA with Jill? 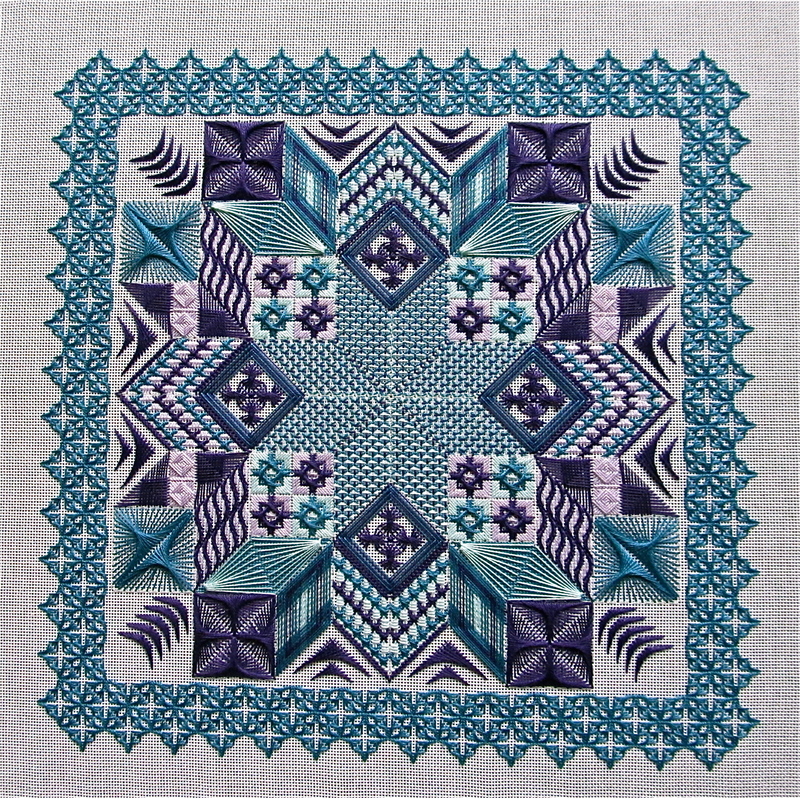 We hope other members will share their stitching experiences on our blog. Please contact Rosie to set up author privileges. If you blogged at seminar — you are ready to go! 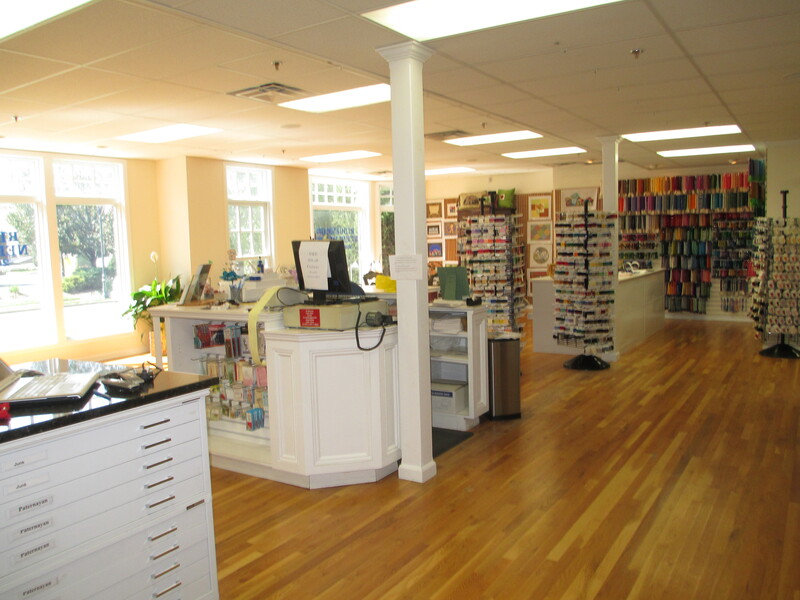 Sue and I decided to extend our Seminar experience a little bit more by making the trek to Ridgewood Needlepoint’s new digs in Wyckoff, NJ. This new location is decidedly closer to us and has the advantage of convenient free parking and lovely natural light. The view from the door! Once inside, the store still carries an array of beautiful threads and painted canvasses. 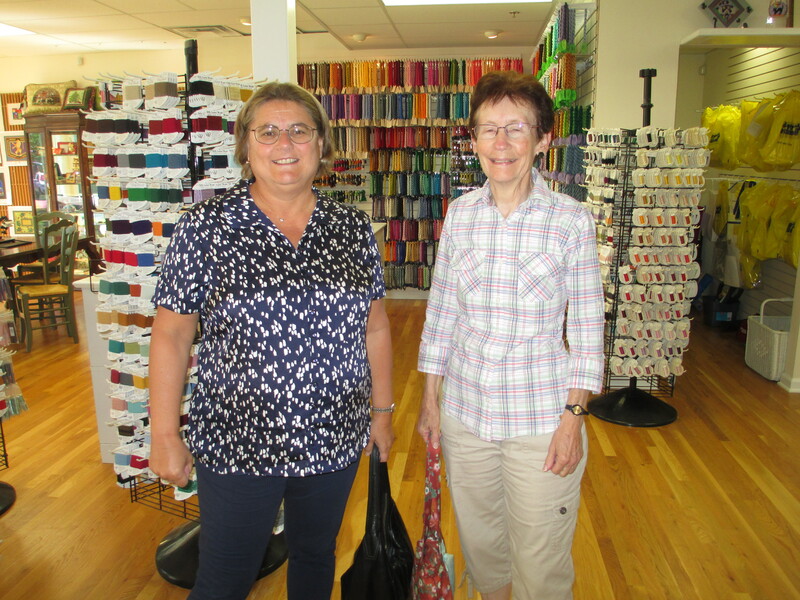 I took my Lombard Street canvas and was looking for threads to implement a different idea for the bricked street — how amazing that this was the day that Eileen Aird, the prior owner and the creator of my wonderful Lombard stitch guide, was visiting in the shop from Tucson! After a couple of hours in the shop, we took their recommendation and had lunch at Cafe Amici — a few blocks away and a waiting line for lunch! Delicious! Of course, we had to stop at Mrs. Stitches when we got back to Mendham! Cheers to all — hope to see you at next week’s meeting. Sue and I are both making steady progress on our Seminar pieces — are you? ?